7 days a week every 30-40 minutes. 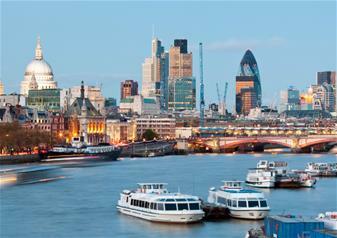 Enjoy an enthralling sightseeing cruise along the heart of London’s River Thames with this hop-on hop-off boat ride. With 5 different piers to choose from (Westminster Pier, St Katharine’s Pier, Embankment Pier, Festival Pier and Bankside Pier), you’ll be spoilt for choice at where to see and explore first. You’ll get to soak in panoramic views of the capital’s most famous landmarks including the iconic London Eye, the historic Houses of Parliament and the towering Big Ben, for a sightseeing experience like no other! Discover the capital’s history as you cruise with fascinating facts throughout as you enjoy live commentary from the captain and audio guides available via your Smartphone in Spanish, Chinese, English, French, German and Italian. Fancy a nibble or two? Every vessel has an onboard bar offering light refreshments for your boat ride – more than enough to whet your appetite! Tickets are valid for 24 hours so you can enjoy unlimited hop-on hop-off as you see the best of London at your own leisure! The service will only run from Westminster Pier to St Katherine’s Pier. It will not stop at the other piers on the 24 Dec and 1 Jan.